Blind-spot monitoring, rear collision alert, and protection systems are all standard equipment for the 2014 Audi S8. Prominently sculpted body lines and an understatedly curved roof come together to create a striking profile for the 2014 Audi S8, illustrating the refinement the brand is known for. The grille is the center piece of the front façade, making itself known with its size and beauty, while also hinting at the power that lays under the S8’s hood. 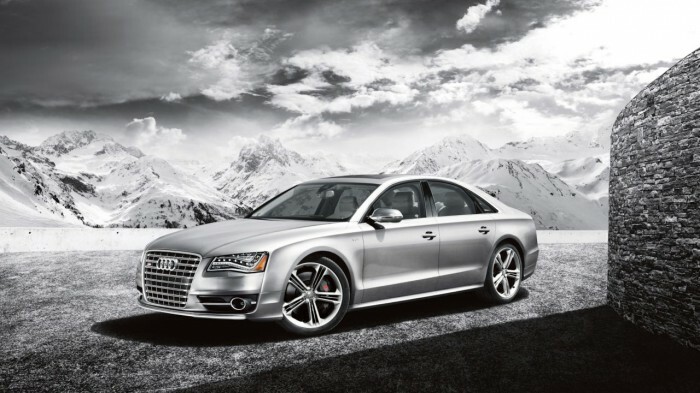 A twin-turbocharged 4.0-liter V8 powers the Audi S8, churning out a healthy 520 horsepower and 479 lb-ft of torque. A standard eight-speed automatic transmission and all-wheel-drive come together to give the S8 enough power to sprint from 0-60 in a mere 3.9 seconds, which is quicker than Audi’s own R8 sports car. With this type of power, high fuel economy isn’t expected, but the number still might surprise you. The EPA-estimated fuel economy comes in at 19 mpg combined, a much higher number than expected. Modern elegance is the best way to describe the 2014 S8’s cabin, combining expert craftsmanship with top-of-the-line materials to create one of the most beautiful interiors in the car industry. The seats are comfortable with the front seats able to adjust 22 different ways, making it so easy to find the perfect seat fit that even Goldilocks would be satisfied. There’s even plenty of head- and legroom in the back for adult passengers. In order to keep the driver connected, the MMI interface makes controlling various functions throughout the car easy. The S8 combines safety technologies with practicality, coming standard with safety features such as antilock disc brakes, stability control, front and rear parking sensors, a top-view camera, blind-spot monitoring, rear collision alert, front-seat side airbags, rear-seat side airbags, full-length side curtain airbags, and front knee airbags. A frontal collision-mitigation system, which monitors traffic for a potential collision, a lane departure warning system, and night-vision camera are all available options as well.